Looking for a sweet treat to serve with tea or coffee? 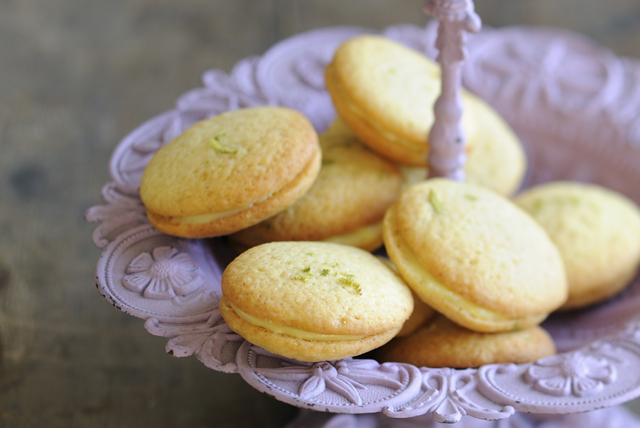 Try our recipe for Lime Whoopie Pies. Cute little lime-flavoured cake-like cookies are sandwiched together with a creamy sweet citrus filling. Prepare cake batter as directed on package, reducing water to 3 Tbsp. Add dry pudding mix, 1 Tbsp. lime zest and 3 Tbsp. lime juice. (Batter will be very thick.) Drop batter, 2 inches apart, into 64 mounds on parchment-covered baking sheets, using about 1 Tbsp. batter for each. Sprinkle remaining lime zest evenly over half the mounds. Bake 14 to 16 min. or until toothpick inserted in centres comes out almost clean. Cool on baking sheets 2 min. Remove to wire racks; cool completely. Mix cream cheese, sugar and remaining lime juice until blended. Spread cream cheese mixture onto bottom sides of plain cookies, adding about 1 tsp. to each; cover with remaining cookies, zest sides up. Prepare using 2 Tbsp. zest and 1/3 cup juice from 2 lemons.